All information to request bookplates from Diana Gabaldon have been removed from this website at her request. Due to her very hectic schedule and the huge demand for her signature, Diana is not able to offer signed bookplates at this time. If you would like to have a book signed by Diana, please please attend an event where she is appearing, or you may purchase new signed copies of her books from the Poisoned Pen bookstore, which ships around the world. In the past, for a SASE, Diana would sign and send free adhesive bookplates to readers that they could place in their copies of the OUTLANDER and Lord John series books. 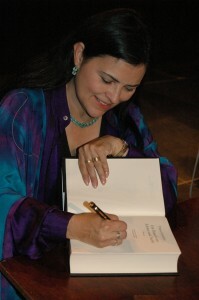 Since WRITTEN IN MY OWN HEART’S BLOOD was released in July, 2014, through July, 2015, Diana has signed approximately 80,000 books at her appearances and for bookstores, plus a large amount of bookplate requests from her home. If you do the math, that means she signed an average of over 220 books per day in that year, not including the bookplates! Her schedule includes researching and writing book nine in the OUTLANDER series; travel to numerous appearances and book signings around the world; travel and work on the OUTLANDER TV series; plus she needs some time with her husband, family, and friends. And of course to eat and sleep! I have known Diana for many years, and since being published in the early 1990′s I can tell you that she loves her readers and does everything in her power to make them happy. At appearances, she stays until every book is signed for readers who attend, whether there are 50 attendees or 3,000. Diana would love to continue offering free bookplates, but the demand has surpassed her ability to sign them all at this time. This page was last updated on Thursday, July 30, 2015 at 1:56 p.m. (PDT). For comments about Diana’s website or suggested corrections, please send an email to Loretta, Diana’s Webmistress. Image of Diana above was taken by Barbara, who maintains her German site.